Two Great Events this Week at the Schneider Museum of Art! 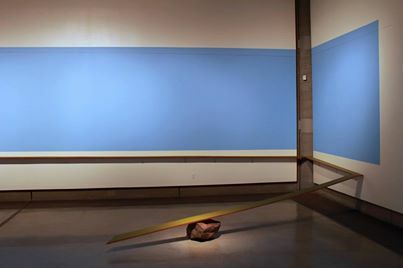 On Thursday, May 1 at 5:30 PM, the Schneider Museum of Art is presenting a lecture by Avantika Bawa, whose installation, Flood.Control, is featured in the Museum’s current exhibition, 3. In Flood.Control, Bawa uses the history and geography behind the formation of Emigrant Lake as the conceptual underpinning of her installation. Immediately after the lecture, Vocalist Christine Williams will perform “Sounding the Gallery” in Avantika Bawa’s installation space. Vocalist Christine Williams, SOU Department of Music Faculty believes that music and art occupy unrelated dimensions of time and space. Those boundaries will be erased as Williams performs “Sounding the Gallery” inside Avantika Bawa’s installation, Flood.Control. Since Bawa’s installation about Emigrant Lake fills the whole of the gallery, Williams will perform solo vocals in response to the work, “sounding” the space as a mariner sounds the waterway she travels. The Schneider Museum of Art will be open all day for First Friday, May 2, from 10:00 AM to 8:00 PM. Please join us at 7:00 PM for a performance of the SOU Dance Performance class choreographed by Ellie Leonhardt, followed by a performance by Terry Longshore and Friends. Ellie Leonhardt is an Adjunct Professor of Dance Performance and Writing at Southern Oregon University. Her expertise is in Modern Dance Technique, Choreography, Contact Improvisation, Authentic Movement, Yoga, Somatics, and Pilates. She received an MFA from Mills College in Dance Performance and Choreography. Students from the Dance Performance class taught by Ellie Leonhardt will perform one of her choreographed works at 7:00 PM on First Friday. Terry Longshore is active as a performer, composer, and educator of percussion and has performed internationally and throughout the United States. He has taught at several universities and currently serves as Professor of Music and Director of Percussion Studies at Southern Oregon University. He will be performing with guest musicians immediately after the dance performance.